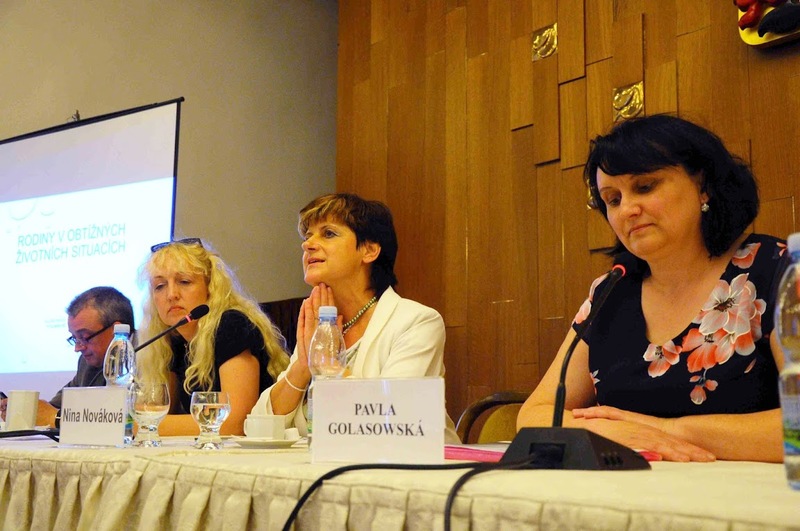 UPF Czech Republic, by Dr. Juraj Lajda, secretary general, June 3, 2015: The Czech Republic chapter of UPF recently convened its third conference in the Czech Parliament on the topic of the family. The purpose of the conference, titled “The Family and the Present Time,” was to inform the participants about pressing issues concerning the family in the Czech Republic and Europe. The two previous conferences were titled “The Family and Society” (May 2014) and “The Family in the 21st Century” (held during a UPF-organized European Leadership Conference in October 2014). At the June 3 conference more than 80 participants listened to presentations by six members of the Czech Parliament and one member of the European Parliament, among other speakers. There was a lively discussion after each panel. The event was organized together with the Civic Institute and supported by the Topaz organization under the auspices of Mrs. Nina Nováková, a member of the Czech Parliament. Dr. Juraj Lajda, secretary general of UPF-Czech Republic, opened the conference by mentioning that the date of the conference was chosen to honor both International Day of Families (May 15) and Global Day of Parents (June 1), both proclaimed by the United Nations. Dr. Lajda reminded the audience that the family is defined in UN documents as consisting of a father, a mother and children. He spoke of the roles of fathers and mothers and described the fundamental structure of the family including the vertical, horizontal and individual, which correspond to the order of the universe. A violation of this order implies the destruction of the society and universe, he said. Dr. Jan Jandourek, a well-known Czech essayist, writer and theologian, spoke about the changes in the family in the last two generations. He compared the family under communism and today. During communist times, the totalitarian society could interfere with the family at any time, he said. The family was like a hostage. Today we have a free society, and there are more opportunities in life. The concept of family also has changed, Dr. Jandourek said. There are more unmarried individuals, and people do not consider the family as important as before, he said. The passing of experiences from one generation to another is not considered necessary, as the young generation can find all information on the Internet. The crisis of the traditional family is a result of the crisis of the traditional society, he said. Mr. Michal Heres, a lawyer dealing with family law, explained that each law is based on traditions and religion. Nowadays family law is given less value in the Czech Republic, and there is no specialization for family law. The courts should not be the ones to decide about children, he said, but rather parents should solve these problems by themselves. Dr. Petr Mach, a member of the European Parliament, was the next speaker. A family consists of a father, a mother and children, he said. It is unfortunate that some trends are attempting to destroy this concept. If we are aware of the family breakdown and find out which laws are destroying the family, then correction is possible, he said. Various feminist projects are being financed by European money. The gender ideology wants to push the limits. In the family there is a lot of freedom and a free environment that disturbs some people, who want to interfere with it. Someone, a government minister or an official, has some idea how to educate children and tries to impose it on others. There are many cases in which children are being taken from their family; Dr. Mach mentioned Norway and Great Britain. There is no reason to take away children from their family just because one parent smokes, he said. The family should be the priority, and the child belongs above all to the family. Dr. Jitka Chalánková, MP (member of Parliament) and a medical doctor, emphasized that politicians should always take a stand on behalf of the family (at least conservative politicians). The adoption of children by homosexuals is not correct, she said. The more the state interferes with the family, the easier it will be for parents to lose their children. Dr. Chalánková is very active in a case in which two children were taken away from a Czech mother in Norway. The second panel was opened by Mrs. Pavlína Golasewská, MP. She outlined some of the factors that are causing difficulties for families: debt, housing problems, various addictions (alcohol, drugs, gambling), promiscuity, mental illness, adverse home environment and lack of education. She suggested some ways to improve the situation, e.g., innovations in the housing law, improving financial literacy, educating young couples to be aware of their responsibility toward their children. Next Mrs. Pavlína Nytrová, MP, proclaimed that there must be a healthy family in order to have a healthy state. The family consists of man, woman and child, she said. Among all priorities, the family should be the first. If it is endangered, the state is also endangered. Nowadays people want to enjoy their lives and nobody wants to sacrifice for others. Individualism is growing, the only value is money, and freedom tends toward anarchy. It is difficult to keep a healthy family, she remarked, with the desires held by young people. Education for parenthood should start at school. She mentioned that last May there was an auction of children in Brussels, and warned that this also could happen in the Czech Republic. If we do not educate our children properly, she said, they will not take care of us when we become old. Mrs. Nina Nováková, MP, said relationships in the family are unconditional. The family is not a company, nor some fellowship, political party or sports club. It is a natural partnership based on unconditional relationships. In the family there is a principle of mutuality and a principle of appropriateness. Nowadays we let the children decide about important matters too early. Mrs. Nováková introduced the term of “qualified parent,” meaning that one should voluntarily take on the responsibility of being a parent. Finally, she stressed the importance of sexual education and education for marriage and parenthood. The next speaker was Mr. Marek Benda, MP. The family can survive if we keep our word and the determination we had at the beginning, he said. That is to say, we should have respect toward our word and toward ourselves. Indeed, nobody should prescribe how the family should behave. He mentioned that there is no border between the rights and duties of parents. The last speaker was Mrs. Radka Maxová, MP and the chair of the Standing Committee on Family Affairs, Equal Opportunities and Ethnic Minorities. She stated that there are 581,000 incomplete families in the Czech Republic, a number she considered high. Children need emotional education, and all habits are passed down to the next generation. There should be more emphasis on moral values—personal responsibility and awareness that one is entering a bond and has to take care of children. Parents are responsible for the family and not the state.